Deli bar at Basher Fromagerie (cheese shop) is one of more than 250 shops and stalls found at Machane Yehuda Market in Jerusalem, Israel. 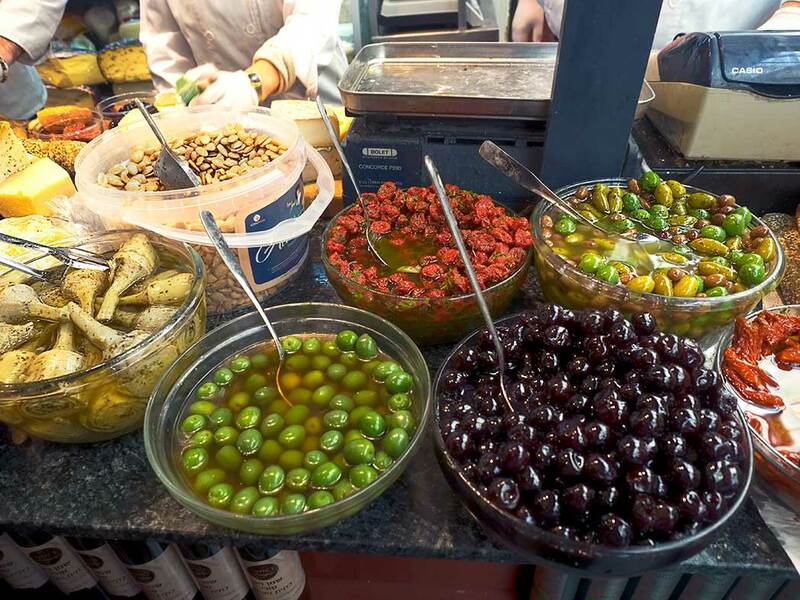 Machane Yehuda is a traditional Middle Eastern style shuk where customers can find everything from fresh fruits and vegetables, to freshly butchered meats, to upscale restaurants. The shuk dates back to the late 19th century during the Ottoman occupation of Jerusalem. Arab traders set up ramshackle stalls on an empty lot outside the walled city. The shuk that we see today began to emerge during the British Mandate period. Some Arabs sold their shops to Jewish immigrants and permanent infrastructure began to emerge. Today, the complexion of the market changes throughout the day. From early morning until late afternoon, vendors sell produce and other foodstuffs. In the evening, clientele flock to its popular restaurants and cafes. All the produce shops shut down around 10 p.m. each evening, allowing the narrow lanes to be washed down with high-pressure hoses. But that’s not the end of the day for Machane Yehuda Market. From midnight to 2 a.m., late night partiers make their way to tiny dark bars that pop up in its deepest, darkest corners to enjoy drinks and live music. How did you like Israel? Just curious because I’ve been there and then immigrating and I absolutely love it despite the political crisis that’s always going on but I stay out of politics. I do find the typical Middle Eastern attitude of pushy salespeople and what not but he just have to go with the flow and be a little more aggressive than you would in Europe or America probably a lot like India would be as I would imagine although I’ve never been. In Israel itself,. I found everyone so friendly and helpful. It is much more liberal than people think and people always say how dangerous it is to me but there have been so many more random killings here in the states.